Many have contacted me two days ago and asked me to give a new weather update on the development of the Hurricane. I’ve waited another day to rely on more certain data on the path and the intensity of the storm. 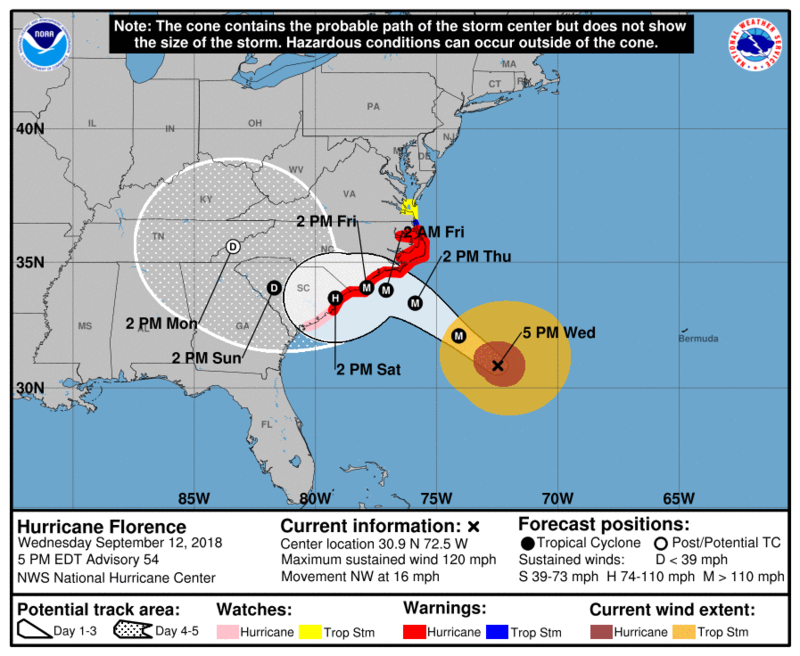 I have attached detailed weather information for all areas affected at the East Coast, including Georgia, South Carolina, and Virginia. Florence will make landfall in the next 24h at the Carolina Coast. It is predicted then to move slowly down the coast, pretty much along I 95 towards SOUTH CAROLINA, before it will turn inwards as a Tropical Storm on Saturday afternoon and will bring heavy rain to the Mountain area by end of this week/begin of next week. Figure 1: Predicted paths of Hurricane Florence. 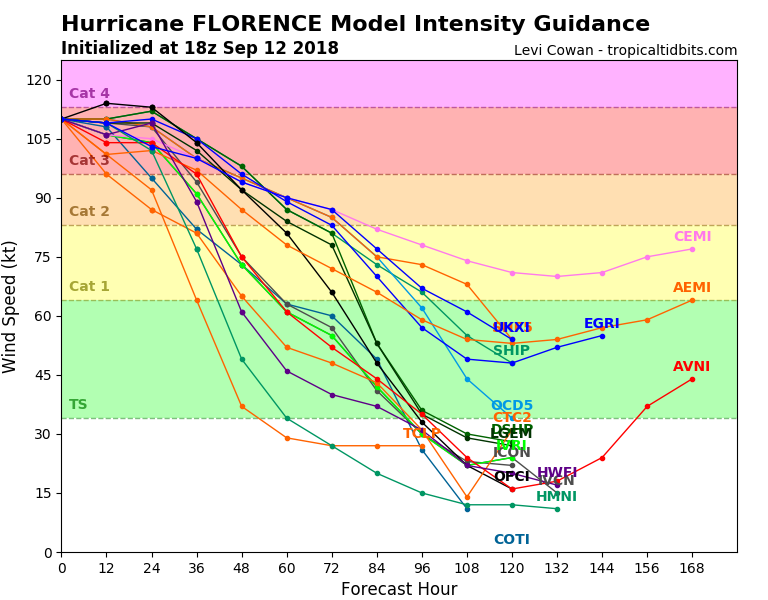 Almost all models predict a path more south than two days ago. Figure 2: Predicted paths of Hurricane Florence with impact radius. Figure 3: Predicted wind speeds of Hurricane Florence. As I have mentioned in my earlier blog post, first and foremost, you and your family should be safe! Prepare yourself, have enough food and water at home, have batteries, flashlights and a radio. Please visit our Disaster Information Center to gain updates and information on how to prepare for the incoming Hurricane. 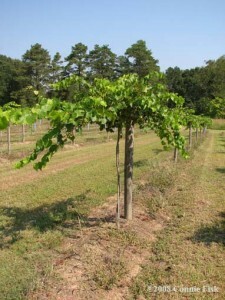 If you are in an affected area at the COAST east of I 95 in NORTH CAROLINA and SOUTH CAROLINA, you will experience heavy wind gusts with potential destructive force to your trellis systems and vines. If you are close to harvest, try to get as many grapes in as possible before the end of today!!!! Try to reduce the canopy on your vines and move ALL equipment out of the field be the end of today! With the new course of the hurricane, it looks like the NC Piedmont region and the Yadkin Valley won’t be affected by high wind gusts and only by moderate rain. The Mountains will experience heavy rainfalls from Saturday to Monday/Tuesday, based on the current predictions. Depending on your crop status, harvest before the rain is advised. Fungicide applications on your red varieties are advised too since Botrytis spores can move around with rain very quickly. Feel free to contact your local extension agent or me with questions.